Soaring above the palm trees this beautiful private suite invites you to relax being soothed by the gentle tradewinids. Enjoy paradise having a panoramic view of the expansive Ko'olau Mountain Range. Watch the sunrise over the country club near Lanikai beach, and see the sunset behind Mount Olomana, the 'Matterhorn of Hawaii'. The studio is private , it has a separate entrance, is situated over the garage,with private parking. It does not share any walls with the main house. In the air conditioned studio is a queen size bed, futon, tile bathroom walk in shower, jacuzzi tub, galley kitchen,and walk in closet. There is a small private outdoor deck to relax and take in the views. We provide beach gear including snorkels , masks, fins, boogie boards, beach towels, and cooler. Swimming, kayaking, stand-up paddling, kite surfing, snorkeling, windsurfing, boogie boarding and surfing are popular activities at Kailua and Lanikai beaches. A relatively easy hike called the Pill Box hike is close by, with magnificent 360 degree views of the ocean and mountains. within 10 minutes drive is either the hike to the top of Olomana Mountain ( called the Matterhorn of Hawaii) and the tropical rainforest hike to Maunaiwili falls. We're just a five minute drive to Kailua where you can enjoy family and fine dining, and shopping Hawaiian relaxed style in the many contemporary shops. Waikiki and Honolulu are 40 minutes away, for cultural events, museums, night life, endless restaurants and entertainment. Waikiki is a great place to learn to surf, and take ocean tours. The North shore a beautiful 1+1/4 hour drive through mountains and pineapple farmland, is famous for world class surfing, botanical gardens, and ancient Hawaiian sites. The Polynesian cultural center is just 45 minutes away for a day of experiencing a variety of island cultures from hula to fire dancing. Whatever your interests, you can plan day trips and easily return to your private, quiet and romantic 'bird nest' hide-away. It is a quiet neighborhood, 7 minute walk or bikeride to the 2 mile long Kailua beach, and close to Kailua town and schools. It is within easy 35 minute driving distance to the airport, and just 35-45 minutes to Waikiki and Honolulu. The bathroom is tile, has a jacuzzi tub, a separate walk in shower, double vanities and a sky light. The mountain view is stunning. We are a 2 minute drive from the 2 mile long Kailua beach and a 3 minute drive to the world famous Lanikai beach. Kailua has become a center for dining and shopping. There is a range from unique stores specializing in surf and paddle shops , surf wear and and Hawaiian arts/ crafts stores. The studio overlooks the Koolau mountain range with Mid Pac country club in the foreground and Olomana Mountain as the prominent mountain seen from the studio. Nearby Kailua beach is very popular for swimming in safe waters since it is a large bay as well as very scenic with ocean and mountain views. People enjoy water sports including surfing, kayaking, stand up paddle boarding, wind surfing, kite sailing. and diving There are rental shops close by for equipment and gear. Sitting on the porch every morning for coffee, then again at lunch, and yet again in the evening...what I can I say, I loved the view so much that I made it my wallpaper on my phone! Dan and Diane are so lovely and this is very private, peaceful, beautiful and clean vacation spot! We will be back for sure! We spent 2 nights here. It was very clean, spacious, conveniently located to town and beach, with a beautiful view facing towards the mountains overlooking the golf course. We much prefer an ocean view, but we thought we'd change it up for once. Since the unit is located adjacent to a golf course you will hear lawnmowing and golfers teeing off in the early morning hours. Other than that the neighborhood was very quiet and the owners were very, very welcoming. If you live in a city, the hum of lawnmowers and occasional pings from golf clubs, and people's voices playing through will most likely go unnoticed. We admit we are hyper sensitive to noises since we are tucked away in the Santa Cruz Mountains where there are no city/neighborhood noises except for occasional air traffic. There are beach towels, chairs, a cooler available. If you return to the unit after dark the path is well lit all the way up to the stairs. Parking is super accessible since its right in the driveway. The unit is in a quiet culdesac, so there is not a lot of street traffic. The owners have 3 furbabies, so if you're a dog person you're in luck because you can get your dog fix! If you're not a fan of our four legged friends, don't worry...you probably wouldn't even notice them because they are not barkers. All in all, this is a perfect place for a couple. Honestly, we spent so little time at the unit with visiting family and spending time at the beach that all we really needed was a safe, clean, place to lay our heads...and this definitely fit the bill. It was a great place for the price and definitely a place to go back to. 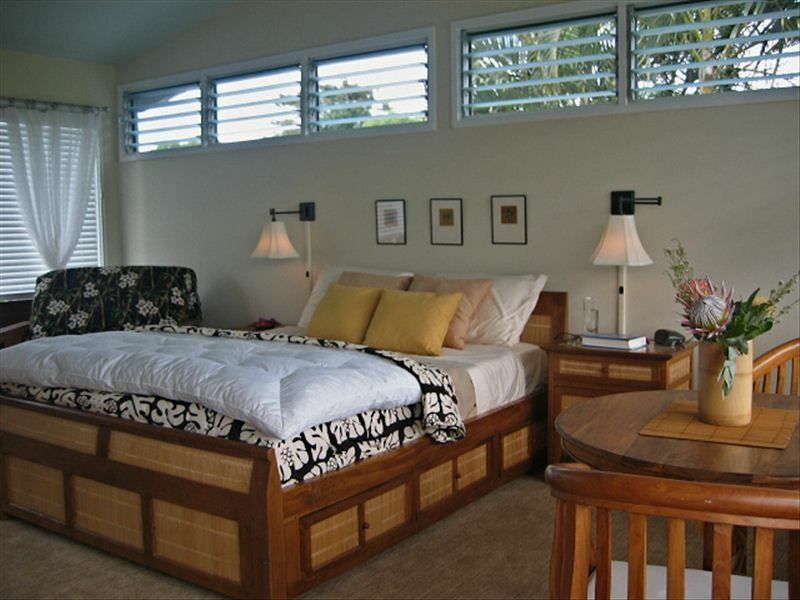 Great view, close to Lanikai Beach & very spacious! Beautiful view & super close to the beach! Plenty of bath towels, beach towels, beach gear (chairs, boogie boards, snorkeling gear). The apartment is very spacious with a large deck, walk-in closet with plenty of room to keep luggage out of the way, and hang clothes. Bedroom is big with plenty of sitting space, although the bed seemed small for a queen size. Bathroom is large enough for 2 people to get ready at the same time. Everything was pretty clean, but kitchen and bathroom could use some paint and minor updates so they don’t feel so dingy. The visitor’s guide needs updating-aside from it being sticky & gross, there was only one place in the nearby dining section, so I texted to ask for recommendations but never heard back. We ate at the nearby pizza place one night (Bob’s), which was pretty good, and Maui Brewing Co. the other, and the food wasn’t great and overpriced. Plus the service was pretty bad. Overall it was a lovely place and I’d likely go stay again in the future :) Thank you! Beautiful studio apartment; priceless views!! Spacious, quiet and private studio apartment with spectacular views of the mountains. You literally can see the mountains when you open your eyes in bed in the morning! The stars at night are breathtaking. Lovely deck along the length of the apartment---perfect for sitting, reading, drinking coffee or wine, and watching the ever-changing light on the mountains. We especially enjoyed the many birds we could see and hear from the unit. Thoughtful extras--fresh flowers, filtered water and a cooler, beach towels and beach chairs. Easy walk or drive to Kailua Beach or Lanikai Beach. Wonderful place to relax and unwind on the Windward side of Oahu. Highly recommend. We LOVED staying here! It was our first time visiting O'ahu, and we wanted to be away from the big city vibe of Honolulu. This location is very quiet and the views are INCREDIBLE - worth it for that alone! But on top of this, the bed was super comfortable and we loved being able to leave the windows open with the ceiling fan going (no need for A/C, even though there is a wall unit installed). Even when it was windy and rainy at night, the room was very comfortable and felt very private. We also made use of the jetted tub, which was great for relaxing after a long day at the beach. Dan and Diane also provide beach gear, including 2 chairs, 2 beach mats, several towels, snorkeling gear, boogie boards, and a beach umbrella. It was super easy to pack the car up and enjoy a long day out exploring and relaxing. The kitchen was just the right size to store leftovers and some beer in the mini fridge and reheat food in the microwave. Overall, amazing location. I would recommend it to anyone visiting Kailua and would love to go back again! Only 2 mins to Kailua and Lanikai beaches, 30mins to airport., 3 mins to historic market, lots of fun restaurants in Kailua town 5 mins from here. Rent stand up paddle rental boards, kayaks, surfboards, bicycles, Segways close by. Bird sanctuary island just a swim from Kailua beach. HIking nearby mountain ranges, or to waterfalls. Waikiki just 30 mins from here for surfing, festivals, Hawaiian cultural events, hula,, music, night life, dining. Honolulu just 40 mins from here for museums, theatre, endless numbers of restaurants and entertainment. The North Shore is a beautiful one hour drive from here for seeing world class surfing, and touring botanical gardens and ancient Hawaiian sites. Honauma bay is 30 mins from here for a day of snorkeling. The Polynesian Cultural center is 45 mins from here for experiencing 'hands on' many Polynesian cultures including fire dancing and hula. Enjoy the island all of its sites, while also experiencing a more 'neighborhood' feel in this quiet setting.